There is no way: every time my friends and I improvise a night out, the decision-making process for choosing the spot is the following: first we go through the newest clubs and bars in town, then the most fancy (which almost never win), then the cheapest, and the discussion goes on till someone says the magic word: “Screw it, let’s go to Linje Tio”. Because at the end, Linje Tio (like the old tram line 10 crossing Hornstull) is the perfect combination of a lively and cozy bar: is energetic but not too chaotic, the background music entertain but still let people chat. 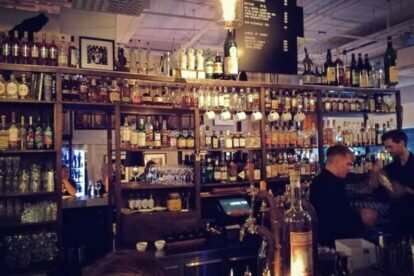 Overall Linje Tio (listed among the best 50 bars of 2017) is an easy going place, no dress code but customers still keep a certain style. Last but not least, quality cocktails are always guaranteed and the selection of wines is pretty good too. From food to drink, everything is inspired from the Mediterranean soil (no wonder I like it!). Linje Tio is also restaurant (open for lunch, dinner and brunch) and a barber shop: honestly, I’ve never tried the food yet, but is on my to-do list (perhaps I’ll skip the barber). From time to time they organize themed night, like the Mojito festival or Negroni night (better prices but same old good drinks).